The Stinking Ship chronicles the odyssey of an oil toxic waste shipment and the human tragedy that followed the dumping of the ship's cargo in the middle of an African city, causing perhaps one of the biggest environmental disasters of the last decade. At the same time, the film examines how a corporation with revenues twice as large as that of Côte d'Ivoire was able to hold the local government on ransom while successfully forcing British media to back off from reporting on the disaster and the company's cover up. 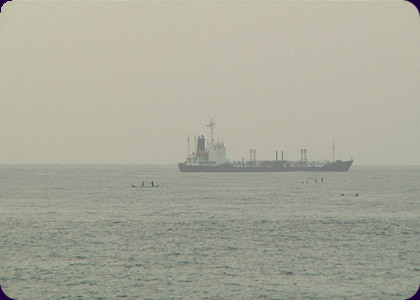 The film starts with a view of the ship, the Probo Koala, when on August 19, 2006 it sneaked into port and spread its toxic cargo across Abidjan, Côte d'Ivoire's largest city. In recollection interviews, residents describe how a strange stench filled the city and the unprecedented health catastrophe that followed that same night. Using archival footage and confidential documents, the film investigates the scandal which started in early 2006, when Trafigura, the world's largest oil and commodities trading company, was looking for cheap ways to dump tons of highly toxic oil chemicals on board the Probo Koala, a ship they used as a floating refinery to process dirty oil bought from Mexico. Bagassi Koura is a graduate of the UC Berkeley Graduate School of Journalism. He has worked for years as a journalist covering West African issues for major global media networks. He has been on assignment in Africa, Europe and in the United States. His stories appeared on PBS Frontline/World, Agence France Presse, the Deutsche Welle, Reuters Television, Die Tageszeitung, Panos Institute West Africa, Afrik.com and others. In 2004, he was awarded the Heinz-Kühn-Stiftung fellowship in Germany for free and independent media. With his new film The Stinking Ship he has won the 2010 Margaret and Williams Hearst Documentary Prize from the University of California, Berkeley.